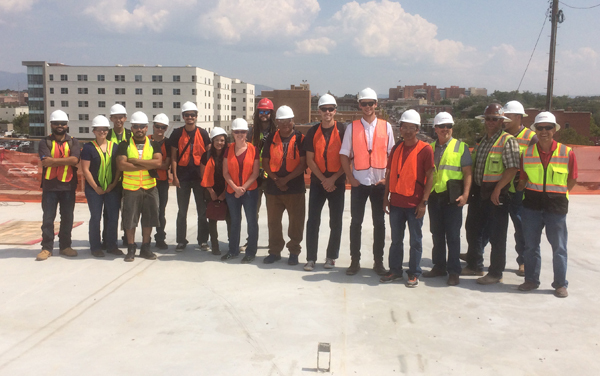 Professor Walter Gerstle and his CE424/CE524 Structural Steel Design class went on a field trip on September 7 to the One Central Building, a six-story office building currently under construction in downtown Albuquerque. They rode the Albuquerque Ride down Central Avenue to the building construction site. At the site, they were shown the building by Structural Engineer George Bradley of Chavez Grieves Consulting Engineers, and by Jason Tabbert, of Klinger Constructors LLC. The building is constructed of concrete (parking garage), steel (first three stories), and wood (top three stories). The students were grateful to get out of the classroom and into the real world.